Description: Comprehensive remodel of circa 1971 municipal airport terminal building. Work involved an interior expansion from 3,690sf to 4,300sf and interior upgrades to operations offices, conference room, lobby, pilots’ lounge and restroom facilities. 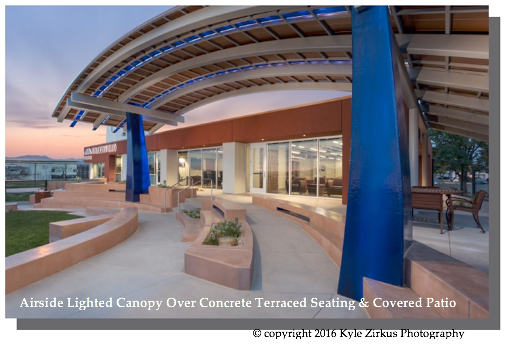 Exterior renovation included a patio and multi-level concrete terraced seating under iconic lighted canopy which mirrors the front entrance canopy at the terminal. Architect: DWL Architects + Planners, Inc.